Woodford Motor Co - Daihatsu & Piaggo Porter - Franchised Daihatsu dealers bordering London & Essex. From the M25 exit south at Junction 27 onto the M11 towards London. then take the 3rd exit to Woodford Green. Woodford Motor company is situated about 400 yards along the Woodford New Road at the junction with Fullers Road. 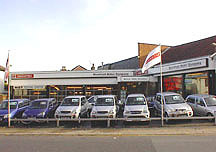 One of the UK's premier Daihatsu dealerships.